A view of the protest rally against Citizenship Bill. Northeast Now File Photo. 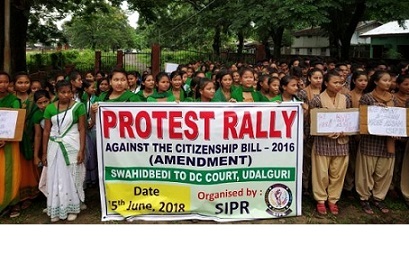 In tune with the state-wide protests against implementation of the Citizenship (Amendment) Bill, 2016, by a number of indigenous organizations, the Society for Indigenous People’s Rights (SIPR), a-newly floated organization, took out a massive protest rally in Udalguri on Friday demanding scrapping of the Bill. SIPR has been recently formed to ensure the political and social rights of the indigenous communities. The protest rally was started from the Swahid Bedi proceeded to the premises of the Deputy Commissioner’s office. The protest rally was joined by the students of various junior colleges and colleges, who holding placards shouted slogans against the Citizenship (Amendment) Bill, 2016. The members of the SIPR handed over a memorandum – addressed to Prime Minister Narendra Modi – to the district magistrate of Udalguri, Karpun Patir. The Citizenship (Amendment) Bill, 2016 has been moved by the NDA Government at the Centre to help grant Indian citizenship to Hindu Bangladeshis, among others. The memorandum stated that a foreigner can never be accepted on religious grounds and granting citizenship to Hindu Bangladeshis would be against the interest of indigenous people in the State as their identity would be under threat. The protest programme was attended by president and secretary general of the Udalguri district committee of SIPR, Banjar Ch Brahma and Demfu Daimari, respectively.